All I currently have are pictures of the rear seats in their various positions. Thus far, these are all the photos I have of seat positions. 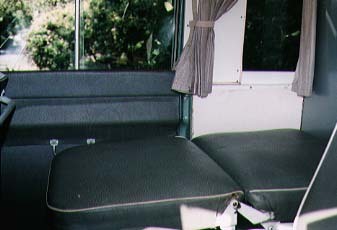 The front seats can be flattened to made the lower 2 person bed. 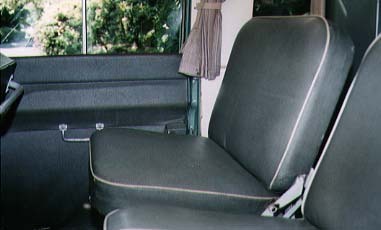 In addition, the large front seat can be flipped such that it faces the rear of the vehicle and makes room for the table. This flip in accomplished by looseneing the hold downs and lifting the seat bottom. By lifting the seat bottom and pushing down and back on the top of the seatback, you can move the seat. 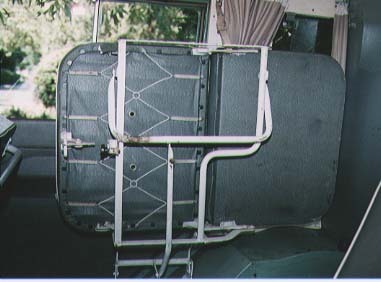 When finished, the seat back is now the bottom and the original seat bottom is the seat back, facing the rear of the vehicle. Using a first generation digital camera, I have taken some photos of the interior of my Dormie to show the original cot fabric and the original curtains and curtain track. The cot fabric is a nylon webbing like stuff. 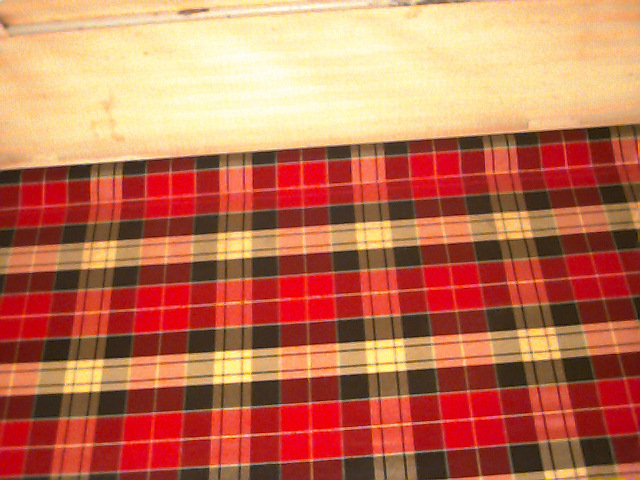 The main color is red, but a thin lime green/yellow stripe also goes through it and it does have black in it. I am looking for something like it but haven't found it yet. If you can help, let me know. 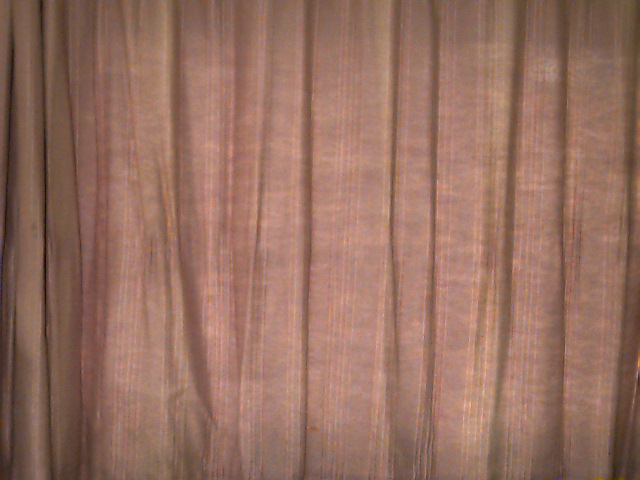 The curtains are just one variation. I am failry certain that mine are original, mainly because of the similarity bewteen my curtains and curtains seen in an unpublished National Geographic photo that I have. In addition, I have a Martin Walter brochure from 1969 that shows very similar curtains. Of interest to me is that most of the curtains have the location where that curtain should hang written in ink. For example, over the stove (left side rear) is written "Left sink". This is written in ink on the white strip that is sewn on to the curtain at the top for mounting on the plastic sliders. The front left side curtain (passenger side for my vehicle) is written "L.F."
This photo shows the curtain for the rear left door. At the top is the curved interior panel that extends from the plastic moulding that covers where the roof was cut for the pop top down to the junction between the roof and side panel. 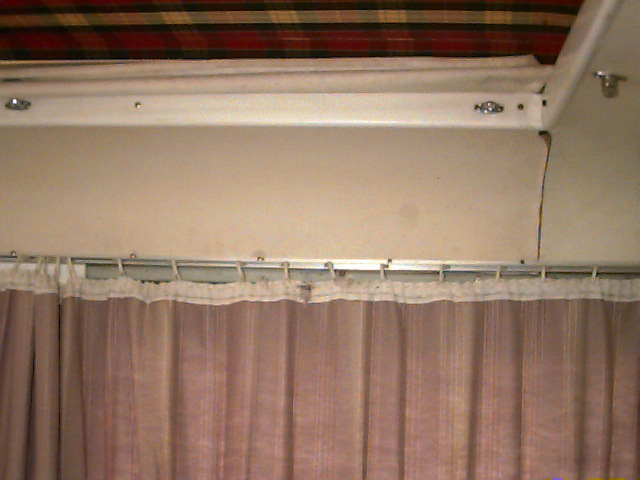 The aluminum curtain track is visible plus the plastic curtain hangers. If you use your imagination, you can see the cotton string that is loosely strung at the top of the curtain and is used to hang the curtain from the plastic hangers. Note that the plastic hangers are two piece. One piece slides in the aluminum track. This piece has an eye that sticks out. The second piece hooks into the eye and has a hook that hangs down that holds the curtain. It is shaped vaguely like a tall skinny "C". The top is rounded and hooks into the eye. The bottom is less rounded and holds the string that is strung at the top of the curtain.